Do Ad Agencies Serve Clients or Their Own Bottom Line? It’s Tricky. I recently reread both the article and letter, and was struck by how little has changed between then and now – at least in the advertising business. Among ad agencies, our search to make money drives many to deliver the answers that are best for their agency profits and their careers, or are the answers the client wants to hear (whether true or not). In a 2012 post by Seth Stevenson, he quotes the editor in Chief of AutoExtremist.com, Peter De Lorenzo, about one such agency: “They’re much more important than the client, in their minds… They make ads to amuse themselves”. New Media and What’s Best for Clients. One area where advertising faces this challenge quite directly is in new media spending. Many new media choices make the agency excellent money. And quite often, the recommendation to use one of these “shiny baubles” sells easily to the client – it’s what they want to hear. Yet the majority of the time the new media choice is the wrong choice, or the weight given to it is the wrong choice – that wastes client money. A recent post by AdContrarian Bob Hoffman (link here) reflects both sides of the conflict agency executives have with new media opportunities. We also struggle when creative departments are separated from results. For decades ad agencies have dismissed measured results (especially sales) as “impossible to know”. Not all agencies, but many. This rejection of results-based goals is regularly used to justify poor ideas (that grow the agency portfolio). There’s an element of truth about the difficulty of measurement. But we must not respond to proof of failure with the stock answer: “but it’s good for your brand”. I can’t tell you how often I hear this. WHAT? Consumer’s weren’t moved but it was still great advertising? The client lost major market share but this writer excused ads that nobody cared about? Unbelievable. Creative departments are too separate from the feedback loops that would help them see how to improve impact. The truth is, creative teams live amid a subjective feedback loop. It starts with “does my boss like the creative?” Then moves to other authorities and peers… Do my bosses-bosses? Do my colleagues at the agency? And does the client Ad Director? Client executives? If it’s liked by all these insiders, then the ad must be fantastic! 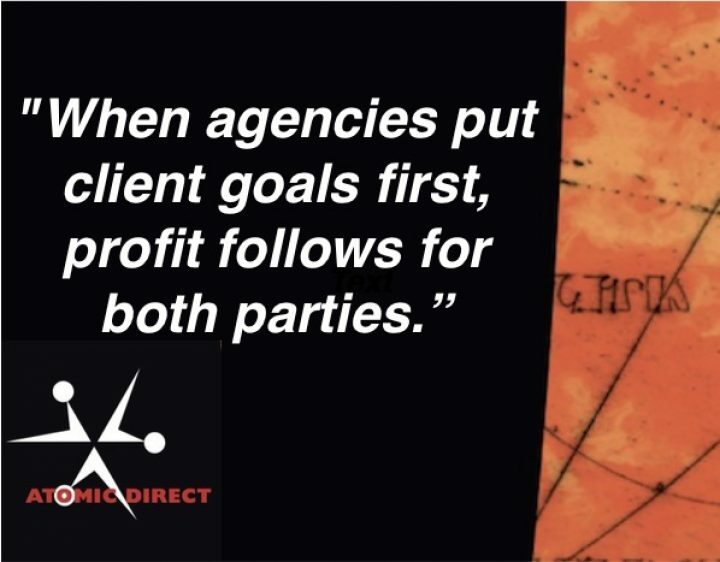 When agencies put client goals first, profit follows for both parties. While it may not be as easy to be a profitable agency this way, when we put clients first, profit is delivered through loyalty and long-term client relationships. And in this age of agency churn it seems that agencies everywhere would benefit from more client loyalty.